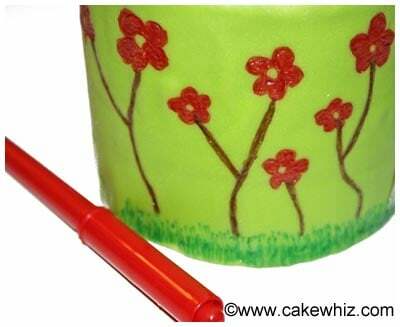 Use this cake decorating tutorial to make a beautiful spring cake with fondant flowers and bumble bee and learn how to draw on a cake with edible markers. 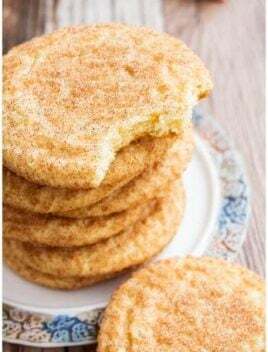 Today, I am sharing a small SPRING cake that I made, after getting INSPIRED by seeing all the beautiful flowers blooming in my backyard. I topped it off with a cute fondant bumblebee and drew simple flowers all around the cake. Instead of painting flowers around the cake, I DREW them with edible markers. 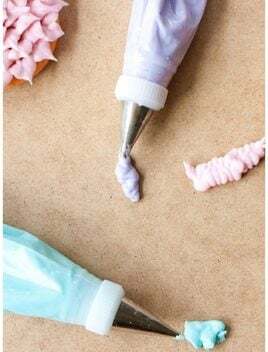 Trust me…this method is so much EASIER than painting with fine tip brushes! After a few minutes, I figured it was lacking in some little red flowers. So, I put these little red fondant flowers around the bumblebee and that was the PERFECT final touch! 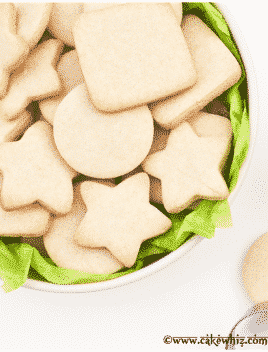 Normally, a single fondant or gum paste flower can take 20-30 minutes to make…SHEESH! But, each of these flowers are ready in LESS than a minute! 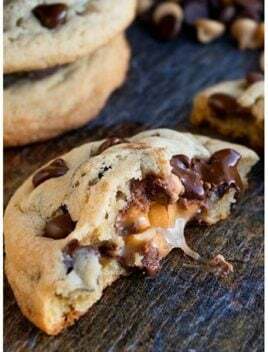 You can even make them in advance and store them for as long as you like. By the way, on a random note… isn’t this bumblebee ADORABLE?! Some of those are downright huge and scary! 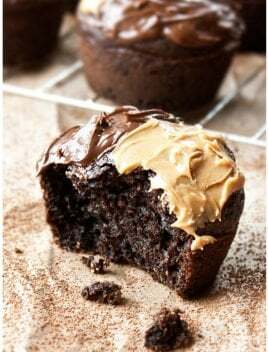 – Use fine tip edible markers like the ones from Americolor. 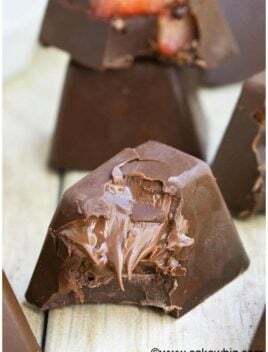 – Allow your fondant-covered cake to sit overnight at room temperature so that the fondant dries up sightly. 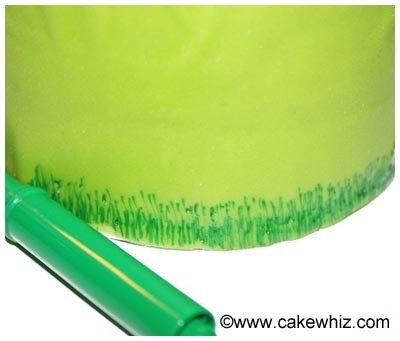 This will prevent the the tip of the markers from digging into your cake plus it prevents the color from spreading everywhere. 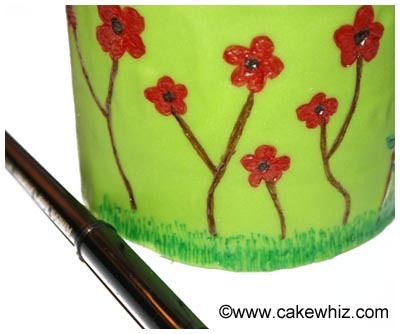 – If you like, you can use a pencil to sketch the design on the cake and and then trace over it with edible markers. 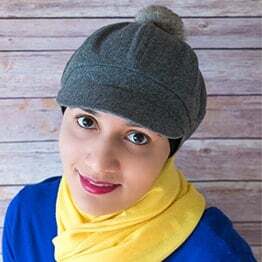 – Remember that a mistake cannot be undone! So, if you smudge something or accidentally dig into the fondant, you will have to make that error a part of your overall design. 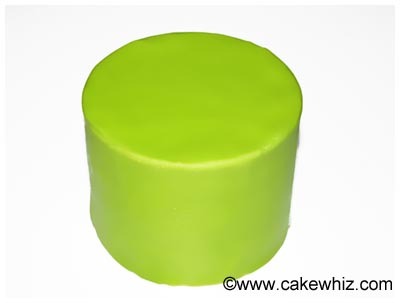 Prepare your cake, frost it and then cover it in green fondant. Let this cake sit at room temperature overnight so that the fondant hardens a bit. 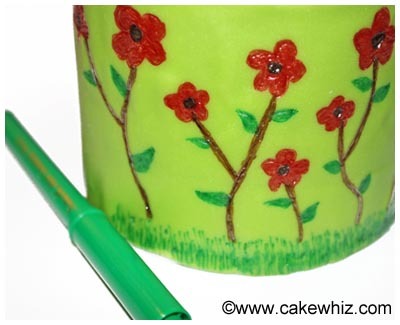 Use a green marker to drawn grass all around the base of the cake. 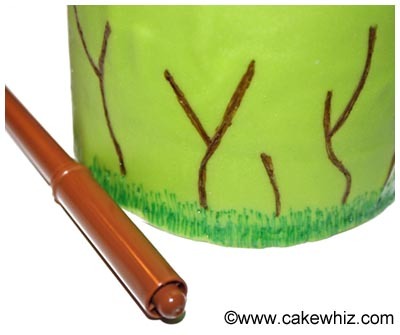 Use a brown marker to draw branches and stems around the cake. Use a red marker to draw flowers. Fill the centers of the flowers with a black marker or you can even stick edible pearls here. Use a green marker again to draw leaves. Place the green bumblebee topper on top and enjoy!